Tyttö on Lili of the Valleyn Jasmine ja kakku on vanha Magnolian leima. Girl is a LOTV stamp Jasmine and cake is a old Magnolia stamp. Awesome! 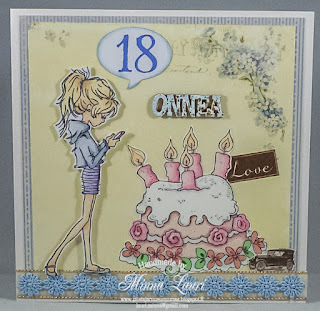 What a perfect card for a teen! Beautifully done! Thanks so much for joining us at The Sisterhood’s ‘Stamp It’ challenge and please come back again soon! Such a beautiful card and gorgeous image. Love the colours and fab details. Thank you for sharing with us at the Ribbon Girl, good luck and I hope you will join us again. Adorable image and card. Thank you for sharing with us at The Sisterhood of Crafters. Super cute and sweet card! Thank you for joining our challenge at The Sisterhood!